I’ve left quantities up to you as this is really a ‘chuck it in the pan and go for it’ kind of recipe, rather than being too prescriptive. Heat up a generous splash of olive oil in a non-stick frying pan. Once the oil is really hot, add the potatoes and season with sea salt and a sprinkling of paprika. Toss them around in the hot oil to ensure the paprika has evenly coated them, then add the diced chorizo pieces. Turn the heat down and cook on a gentle heat for 20-30 minutes until the potatoes are cooked but not falling apart. Turn up the heat to crisp them off a little, then when they’re ready, remove them from the pan with a slotted spoon so you leave some of the fat behind. Perfect as a Tapas style dish or as an accompaniment to meat/chicken dishes. 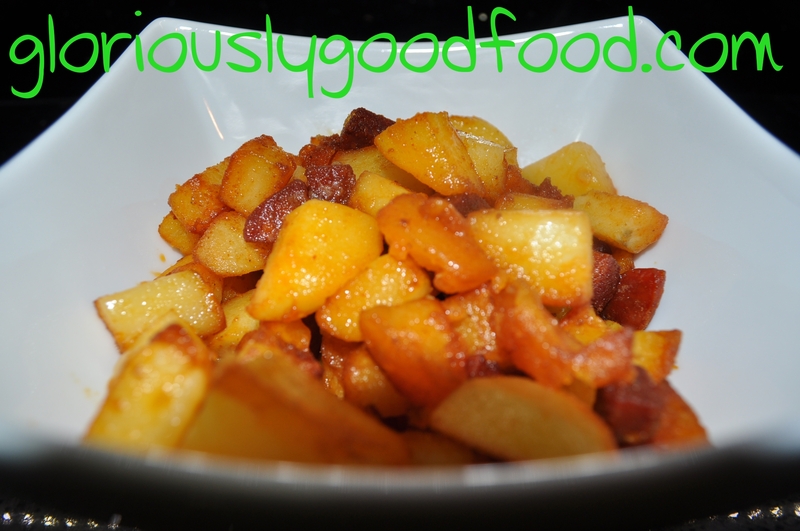 Chorizo potatoes | Gloriously Simple, Glooriously Good! This entry was posted in Meat & Poultry, Pork, Potato, Vegetables and tagged chorizo, chorizo potatoes, potatoes, potatoes with chorizo, sauteed potatoes. Bookmark the permalink.